The console is the result of painstaking work. 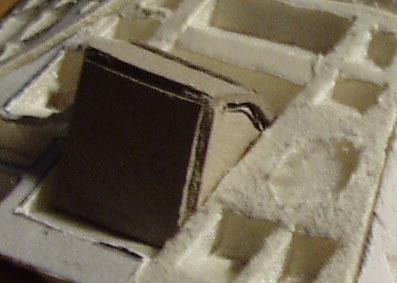 The top sections are each made of foamboard with the button recessess carved out of the foam. 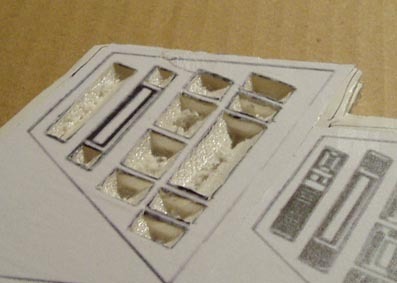 The screens were made of card and inserted into the recesses. The base was also made of card with card detailing. 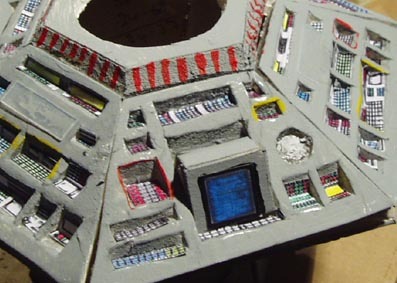 The buttons were all cut out of a schematic of the console coloured in photoshop. The 'BBC basic' screens were taken from screencaps of the show. A trim was placed around the edge of the console. 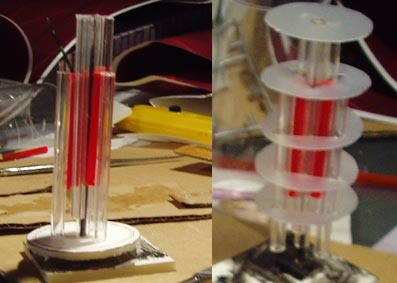 The time rotor is a perspex tube, the internal workings contain transparent and red perspex rods with rings of plastic sheeting. 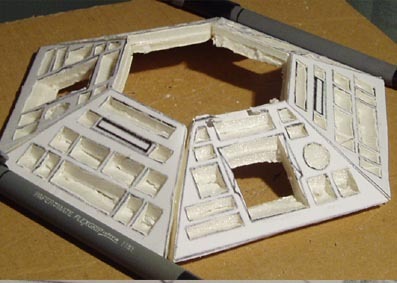 The console room is made of five foamboard sections that slot together. The columns that cover the joins are cut and folded paper. The roundels are made by filling the holes with PVA. 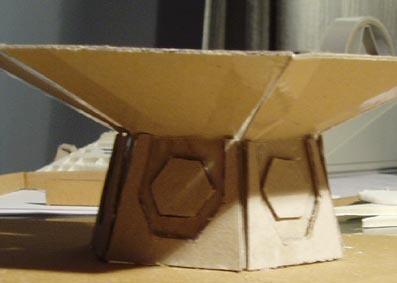 It has been dressed with the hat stand from the CO TARDIS console room. Left Sarah Jane and friend revisit the Doctor. This one off short was posted in July optimistically ahead of the release of the classic figures. It was written obviously in celebration of the upcoming classic range of figures about which the AFT has been excited since they were first announced in August 07!! This is one of several possible stories that were proposed. 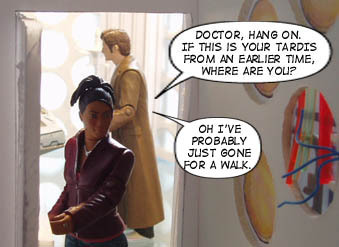 Other more long winded adventures included a kind of 'search for the Doctor' story where the Doctor or a companion has to seek out his former selves. All other ideas were decidedly convoluted, while this idea, the Doctor stumbling into his own past was the simplest and could be shot in the absence of the classic figures. The Doctor's last line "The Past is another country..." is taken from LP Hartley's 'The Go-between'. As it's a very short story, it was shot and edited entirely on the 15th March 2008. The forest is made up of artificial plants and flowers from a hobby shop. You'll be seeing more of those in the future. This story went for a long time under the working title Countdown- as in 'countdown to the release of the classic figures'. Another proposed title was 'Looking Back'. The final title 'Memory Lane' was coined long after the story was edited. The pages on the site still bear the name "Countdown". 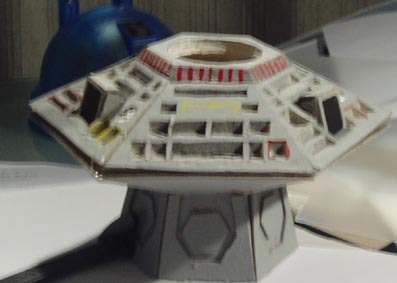 The TARDIS exterior prop is the Flight Control TARDIS which is markedly different in appearance to the Police Boxes used during the classic era. I have used photoshop to alter the 'pull to open' panel from white to black just to hint that this isn't the 10th Doctor's TARDIS. 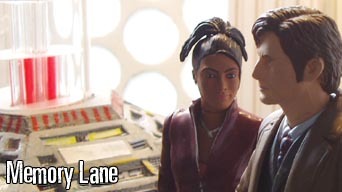 Clearly for the Doctor and Martha, this story takes place sometime during series 3 and at the end of some unseen adventure. 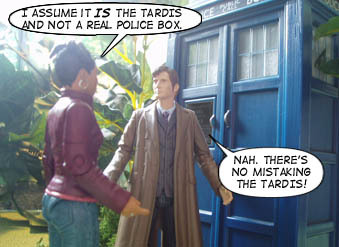 I've placed it after 42 as this is the first time Martha gets to hear about the concept of regeneration. 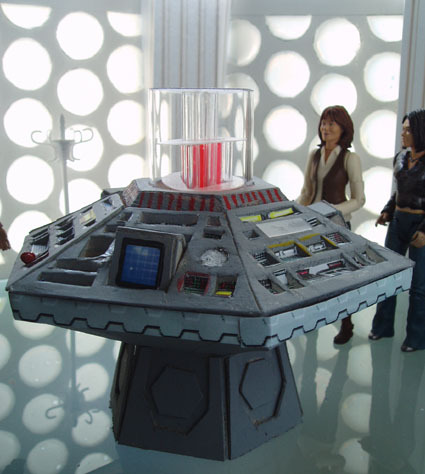 This particular TARDIS console fist appeared in The Five Doctors. The corridor just off the console room has a roundel missing with wiring exposed reminiscent of the 6th Doctor's attempts to repair the TARDIS during Attack of the Cybermen. Perhaps this is the 6th Doctor's TARDIS.